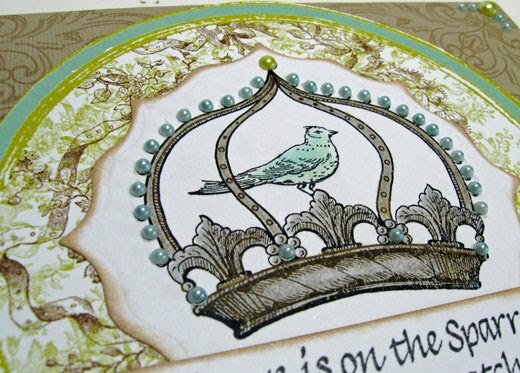 Today I have something that I created using the newly released Layers of Color cling art stamp "Bird Queen", as well as the Layers of Color Acanthus Leaves art stamp set. I have to admit this is a little out of my usual style but I had fun with the vintage feel of it. 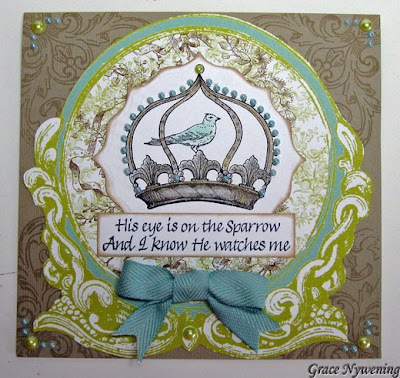 I stamped the Acanthus Leaves with VersaMark on a Bazzill base and stamped the bird queen image on GPW, colored with Prisma Pencils and blended with Gamsol. I cut the image out and adhered it to a Nellies Die which I sponged with Color Box Creamy Brown Chalk Ink. The sentiment is from Anticipations and I adhered both to a Webster's Pages diecut which I just love. I added some bling and Martha Stewart Twill ribbon and left it pretty clean. Thanks so much for stopping by! I hope this reminds you of Matthew 6:26 "Look at the birds of the air; they do not sow or reap or store away in barns, and yet your heavenly Father feeds them. Are you not much more valuable than they?" GASP! Your card is a jaw dropping gorgeous work of art, Grace!! Wow!! Grace...you did a beautiful job with this gorgeous design...sooo elegant and classy looking!!!! LOVE love love the detail on the crown! Just gorgeous! Wow! This is different from your usual...but it is fabulous! I thought of that Verse as soon as I saw the bird and crown. Thanks for putting it out there! I was thinking of so many ways that crown could be usen on Christian art! This is beautiful. I love the look of the frame. And, the pearls that match the bird and the frame is just great, Grace. Grace this is BEAUTIFUL, LOVE all the pearls!!! What a gorgeous color combo and layout!! This is absolutely gorgeous, Grace! Wonderful colors and images and composition! Every detail is perfect! Looking forward to seeing you on Saturday! This is so beautiful and one of my favorite words of comfort. Love your music also! Blessings! This is gorgeous Grace!!! I just love the frame around the image!! Stunning design my friend.